The CRPGL group is a newly formed lab in Luxembourg. 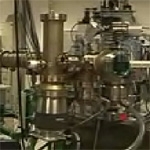 Within the project their role is to start looking at `scale up`, plasma treatment at larger scales than is possible in the other labs, coupled with a battery of different sample testing techniques. View video diaries and other project information. Link to Vega Science/BBC OU Discussion on Nanotechnology.